Each year, one in five American adults experience a mental health issue. Bert Nash Mental Health Center is training the Lawrence community to recognize such problems and respond appropriately. Just as law enforcement professionals, educators, employers, and co-workers prepare to help in physical emergencies, they can also lend important first aid support to individuals who may be experiencing a mental health crisis. 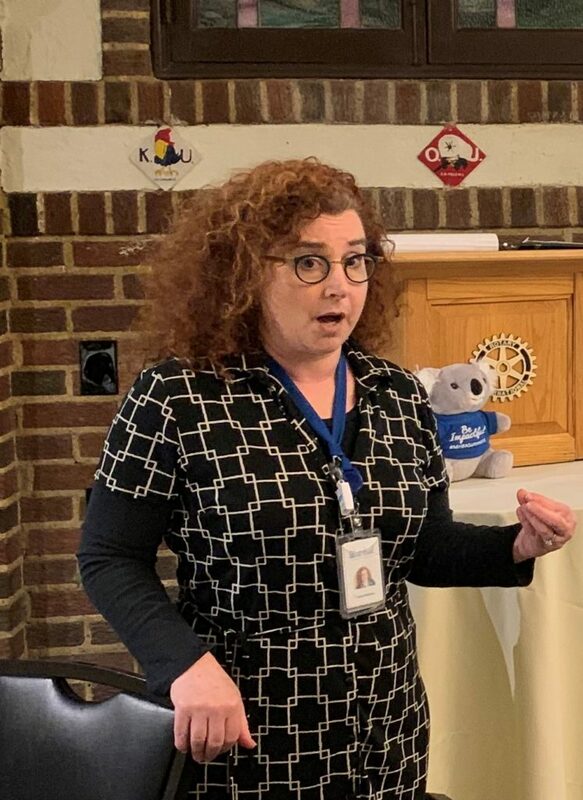 Carla DeHerte, WRAP Program Team Leader at Bert Nash, explained the key elements of the Mental Health First Aid (MHFA) protocol. The 8-hour training teaches how to recognize warning signs and provides background information on depression, anxiety, trauma, psychosis, and substance use. Participants learn a five-step intervention strategy and come away with a list of resources. The primary goal of the training is to overcome stigmas related to mental illness and to promote understanding. 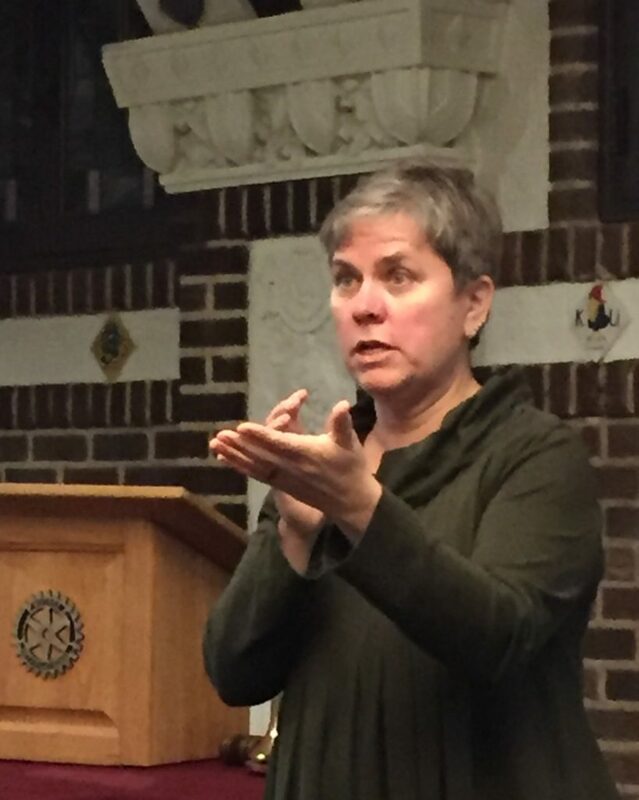 Beth Whittaker gestures as she explains the variety of the Spencer Research Library collections. Kenneth Spencer Research Library is the rare books, manuscripts, and archives library of the University of Kansas. Researchers can tap into a variety of collections, including Special Collections (established in 1953), the Kansas Collection, and the University Archives (established in 1969). 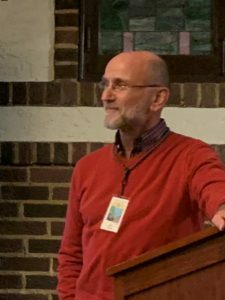 Topics range from photos of Kansas over the decades; materials about ornithology and other natural history topics; science fiction; the history of education; Latin American holdings; ancient manuscripts, atlases, and much more. There is even a collection about contemporary political movements. KU Musicologist Paul Laird has devoted much of his career to studying conductor and composer Leonard Bernstein (1918-1990). During the past year, he has given numerous presentations on Bernstein and his work as the world celebrates the 100th birthday of this extraordinary talent. Laird admires Bernstein’s “absolute musicality,” his knowledge of musical styles, his fabulous ear, and his extraordinary charisma. Laird has written five books about Bernstein, among them Leonard Bernstein: a Guide to Research. The book begins with an essay on the composer’s achievements and continues with annotations on Bernstein’s writings, performances, and educational work. When asked, Laird declares that “West Side Story” is his favorite of Bernstein’s works. Excaliber, a choir of seventh and eighth graders from Central Memorial Middle School, performed for Rotarians and their guests at the annual holiday luncheon.